By now, Yankees fans know the story well. 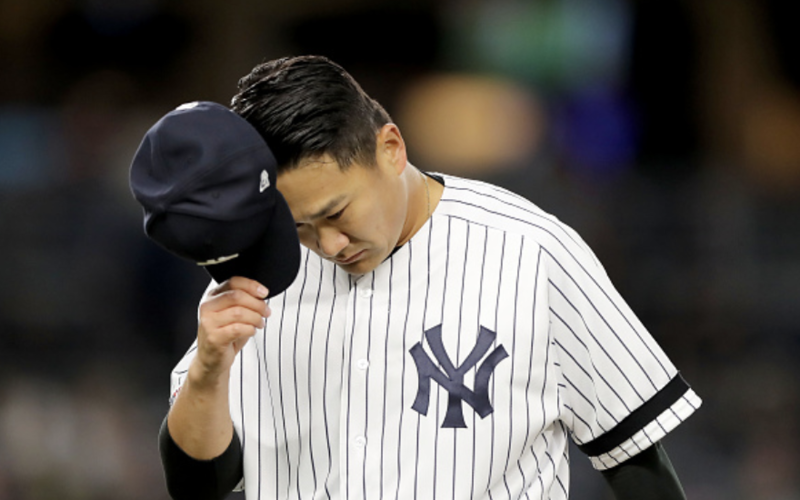 For the past two seasons, Masahiro Tanaka has labored through the first half of the season, putting up abysmal numbers and leaving fans groaning due to his inconsistency. Then, like magic, he flips a switch in the second half of the year and puts together a string of solid performances that carry over into postseason dominance. In 2017 and 2018, he posted ERAs of 5.47 and 4.54 in the front half of the season. His struggles were characterized by high home run rates (2.03 and 1.94 HR/9) and an inability to fool hitters with his deceptive arsenal. As a measure of the drastic differences between his first and second half stuff, his K-BB% was just around 17.5% both years in the first half, but rocketed up to around 23% in his second half performances. While it’s hard to pin down exactly what accounts for this strange pattern in Tanaka’s performances, there is no question the Yankees will need him to carry his ace-like potential through the full 162 game season this year. With unquestionable staff ace Luis Severino still in limbo due to a shoulder injury, CC Sabathia guaranteed to spend a couple stints on the shelf, and significant injury concerns swirling around new acquisition James Paxton, Tanaka’s performances will be crucial to the Yankees’ success in 2019. Thankfully, through his first three starts of the new season, Tanaka looks very much up to the task. With a pitch composition dominated by his splitter and his slider, Tanaka’s success is very much driven by his ability to keep hitters off balance and avoid hard contact. Of course it is too early to draw sweeping conclusions, but Tanaka is thus far putting up numbers in line with his career bests in all the categories you would look to in order to gauge his effectiveness. Despite an absolute moonshot by Jose Altuve on Monday, Tanaka is currently blowing away his career averages in HR/9 and GB%. There has always been a dissonance between his reputation as a crafty righty and his propensity to give up a high rate of fly balls and home runs. So far in 2019, his HR/9 rate of 0.49 and GB% of 57.4%would both represent career bests. That is more in line with what you want to see from a pitcher who does not live and die by the strikeout. And there are some indicators in the underlying data that this strong start is no fluke. Last week I told you that O-Swing% and Z-Contact% were great ways to gauge how well a pitcher was managing to fool batters. Well, through his first three starts he has achieved an O-Swing% of 42.3% and a Z-Contact% of 83.1%, both of which would be — you guessed it — career bests. Finally, if you enjoy the Statcast data, Tanaka has been masterful at keeping hitters from driving the ball, as evidenced by his Barrel% of 6.8%, his average exit velocity of 86.1 mph, and his average launch angle allowed of 6.2 degrees. The best comparisons for that batted ball profile in 2018 would have been Aroldis Chapman, Jacob deGrom, and Justin Verlander. It’s obviously optimistic to expect Tanaka to keep posting numbers of that caliber throughout the entire year, but it’s an indicator of just how hot a start he’s had to this season. We have seen how good Tanaka can be at his very best. From 2014 to 2016, he posted an ERA of 3.12 and a WAR of 9.8, both in the top 20 among qualified SP over the period. And while slow starts have marred his full season stat lines the past two years, we have continued to see glimpses of the elite pitcher that he can be at his best. A career 1.50 postseason ERA also demonstrates that he can perform on the big stage when he is most needed by the team. Right now, there is no question the Yankees badly need Masahiro Tanaka to be the most dominant, consistent version of himself. Though admittedly two of his first three starts have come against the lowly Orioles and Tigers, he has not shied away from the challenge and has posted exactly the type of performances you would want to see out of the Japanese righty. If he can continue to fool hitters and avoid the home run ball that his plagued him throughout his career, expect a big year out of Tanaka when the rotation is in dire need of an anchor.